That is what I felt the entire time I read this book. Frustration. And I guess if the author can evoke that much emotion in a reader, then she did a good job. I do have to say however, the topic is controversial and anger inducing. The Good Sister tells the story of two sisters; Simone and Roxanne. Simone is a mother of four and suffering hopelessly from post-partum depression. Roxanne is the "good sister" who seems to be the only person who really is watching out for her. Their mother Ellen is self absorbed and blind to Simone's mental state. Johnny, Simone's husband, is as supportive as he can be, but really he wants a son and after four daughters, he is going to keep trying to get one. Ty, Roxanne's husband is struggling to be second fiddle to his sister in-law. And then that leaves the children; twins Victoria and Valli, who just want some damn attention; Olivia, the poor baby who falls under the most danger and Merell; the oldest, who witnesses the truth of her mother's madness. So there you have it. A whole mess of crazy. What gets this book going is Merell's phone call to the police. She witnesses an "accident" with baby Olivia and her mother in their swimming pool. The investigation is swept under the rug due to Johnny's ties in the community and they all continue with life as they know it. But Merell knows better. And Roxanne knows better. But yet it takes the whole darn book to DO something about this poor woman's mental health. I couldn't put it down but I was really angry at everyone. I know that post partum depression is tricky and needs to be handled in a delicate manner. But to me the little ol' reader, Simone was badly in need of help and just didn't get it in time. Yes, I was angry at her for the things she did or more importantly, what she didn't do for her children. But, I couldn't blame her, because her mental health was so far gone. As a mother, I prayed that I will never experience this but no one really knows. The chemical balance within your body and brain before and after birth, changes so much. Any woman could be the victim of this. The author shares her personal story about her own mother and her battle with post partum depression. Luckily her mother came out of it and her children were not harmed. This book is not for the faint of heart, especially if you are a mother. Recommended by with caution. It made me extremely sad and pissed off at times. I was anxious and irritated all at the same time. That may sound like I did not "enjoy" the book and that may be correct. BUT I can attest to the power of this really intricate, solid novel full of drama and emotion. The author did a wonderful job in that sense. It just left me with a very heavy heart. Most definitely. This would bring up a lot to discuss, especially if there are mothers or parents in your group. What makes a good mother? If you were not of the right mind set, who could you trust in your life to really give you the help you so desperately need? Sounds like a really powerful book. I just read this recommendation off of amazon last night, so glad to see a review. I considered it but sounds fantastic, I love emotional books like this, so sad but I love them. I have this one on my Kindle. I need to get to it soon. Thanks for sharing! I'm always drawn to sister tales. 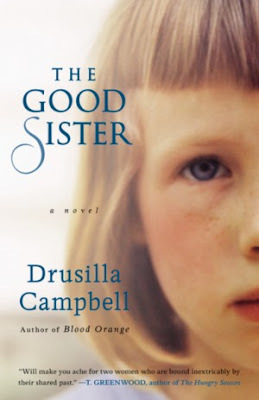 The Good Sister by Drusilla Campbell is on my TBR. It sounds like a sad and thought-provoking book. I love powerful books like this one. Thank you! Wow, sounds like this brings up a lot of issues. I was just talking with a co-worker the other day because we were saying how anyone is susceptible to mental health issues like that. This does sound like a great book club pick. Anything that can stir up that kind of emotion is bound to stir up a lot of discussion.